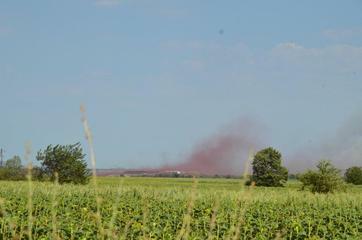 Pyrite cinder dispersion - The pyrite cinder is being dispersed by wind to agriculture land. Transport of pyrite cinder in open trucks - The trucks loaded with pyrite cinder from Prahovo. 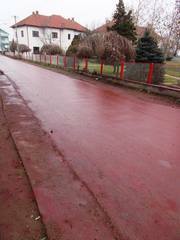 Red roads - The roads on the transport route get red of pyrite cinder being dispersed from uncovered trucks. The historical and new pollution from production of phosphorous fertilizers in the Elixir Prahovo has resulted in the opposition by local people and NGOs. However the case is still far from being closed. A chemical factory in Prahovo (IHP Prahovo) established in 1960 is located on the right bank of river Danube near the town Negotin and the villages Prahovo and Radujevac in Eastern Serbia. The people from these villages are agriculturalists or employed in the chemical industry. The company manufactures phosphorus fertilizers, acid, detergents and chemicals for domestic use. Between 1978 and 1992 manufacturing capacity peaked and at the end of this period IHP Prahovo employed 4500 workers. The poor environmental management and lack of environmental protection measures resulted in the establishment of industrial uncontrolled waste dump sites containing 2 million tonnes of toxic pyrites cinder and 10 million tonnes of probably radioactive phosphogypsum. The dust from dump sites (40,000m3) has been dispersed by the wind, polluting more than 100 ha of fertile agricultural land and drinking water sources, while phosphogypsum have been gradually washed down into the Danube River creating several meters high deposits on the river bank. Several times since 2004, the local community and NGOs reported the company to environmental inspection demanding a solution to this historical pollution, however with no success. The factory was privatized in 2007 for the first time, and since 2012 it is owned by the Elixir group DOO and changed its name to Elixir Prahovo, with plans to continue production of phosphorous fertilizers. In 2012 Elixir group started the process of revitalization of the Prahovo factory. As there was no possibility of processing this kind of industrial waste in Serbia Elixir sold 2 million tonnes of pyrite cinder from both Prahovo to a Chinese company interested in it due to its high content of the iron ore. The buyer from China committed to transport the complete amount of pyrite cinder until June 2013. The transport of the pyrite cinder from dump sites to the port on the Danube (from where it was shipped further to China) was done in open trucks passing through the neighboring settlements. This resulted in pyrite dust pollution and was reported by neighboring communities to the Environmental Inspectorate and police. The local communities assisted by NGOs made a documentary movie to present the case to the broader public. The community protests resulted in the company responding by emphasizing its social responsibility and construction plans of facilities and equipment under the highest European standards, and promised to include more frequent cleaning of the trucks and washing the roads. However, due to the significant pollution already released, the local NGO contacted the environmental inspection and environmental ministry to continue to pressure the company to conduct an environmental assessment of land pollution levels and do the necessary actions to remediate the polluted land. In February 2015, the company announced plans to in 2016 build a new dump site for phosphogypsum (46.5 ha) and ash (12 ha) under the EU standards. The old phosphogypsum dump site is still in use. Local NGOs and people are against it. The Ministry of agriculture and environment approved the EIA study for this project. Project Details The uncontrolled dump site has 2 million tonnes of pyrite cinder and 10 million tonnes of phosphogypsum. Elixir group DOO from Serbia - Owner of the Elixir Prahovo factory and historical dump site of IHP Prahovo. Elixir group DOO work is related to agriculture production and export of seeds, fertilizers, pesticides and frozen fruits. Relevant government actors The Ministry of Agriculture and Environmental Protection of Republic of Serbia; Inspectorate of Environmental Protection, Republic of Serbia. Development of Alternatives While the communities living close to the Prahovo historical dump site are satisfied with the applied solution, the citizens of villages located along the waste transport route are not so and together with support of NGOs have been demanding from the company to minimize the dust dispersion from the trucks by apply adequate measures during the transport. The company claim it has been using 70 tanks of water daily for cleaning roads. The NGOs and local population of several villages is against opening a new phosphogypsum dump site announced in 2015. The NGOs demanded from the local government to introduce a continuous monitoring of pollution in the area to control level of air pollution from the factory. Why? Explain briefly. Despite the intentions to solve the historical pyrite dump site problem, the project activities expanded the dust emissions and exposed the citizens to further pollution. No sanitation of contaminated soil and roads was done to diminish dispersed pollution in villages and roads neighboring the dump site. Furthermore, the 10 million tonnes of phosphogypsum are still located in the old dump site, while the new dump site is planned to be opened in 2016. In addition, the factory production process is source of air pollution. Pyrite cinder dispersion The pyrite cinder is being dispersed by wind to agriculture land. Transport of pyrite cinder in open trucks The trucks loaded with pyrite cinder from Prahovo. Red roads The roads on the transport route get red of pyrite cinder being dispersed from uncovered trucks. Other Comments Elixir group DOO bought five other old fertilizer factories in Serbia and among them the big ex-Yugoslav producers of fertilizers Zorka Sabac. The company invested in revitalization of Zorka factory and in the further production of phosphorous fertilizers. The same project of transporting pyrite cinder was organised from the historical dump site of Zorka Sabac. Due to the Zorka dump site proximity to the river Sava, transport was done in an assembly line that diminished dust emission, and did not provoked the reaction of the local communities.